Even though I should've expected it, this book still took me by surprise by its funny approach on such a serious topic--and I say surprise and funny in a good way. Comedy was the theme for A Messy, Beautiful Life. From the main character's voice to the way she dealt with her diagnosis, there was a light vibe the story maintained from start to finish. Since Ellie and her friends were a part of an improv comedy group, the book introduces humor right from page one. I was immediately drawn into Ellie's world by her voice, her group of friends and Jason, the love interest. I loved that they met during an improv show and that they were in sync from moment on. There was enough chemistry to make me want them together from moment on. The entire improv comedy scene made this book fresh and entertaining. I can't remember reading anything with this theme, and while some of the scenes were a bit of "fade to black" (for a lack of a better term), there were a few other that showed the jokes and they were pretty funny. But the things I liked most about this story were Ellie's relationship with her friends, parents, Jason, and the way she dealt with her disease. This was a character-driven story that worked because the characters were interesting. Ellie's two best friends could've used a little more work, since they didn't have different enough personalities to set them apart, but they were still amazing friends to Ellie. There was none of the unecessary girl-hate drama. But the star of friendships for me was the one between Ellie and her stepbrother. I loved how Craig came out of his shell and showed Ellie how important she was and how great of a big brother he could be. Every scene between Ellie and Craig was awesome. Ellie's relationship with her mother was another plus, and even the drama with her father was handled well. Now, as for Ellie and Jason, like I said before, I felt their chemistry from the start and I liked that Jason's past was connected to Ellie's present in a sad, but still meaninful way. I also liked how they worked through it and found a way to be happy. 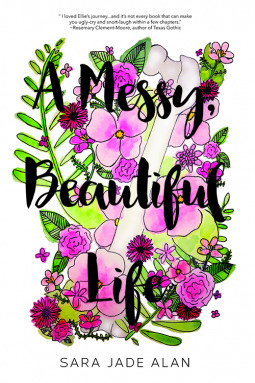 When I say A Messy, Beautiful Life handled Ellie's diagnosis in a funny way, I mean funny as in a "this won't get me down and I'll keep fighting" approach and not as in "I'm making fun of something serious." Even Ellie's stand up comedy show focused on her cancer was tasteful. In the end, I think this book succeeded in bringing a different, light and funny way to deal with such a serious topic, and the good dynamic between the characters and cute romance acted as a bonus.